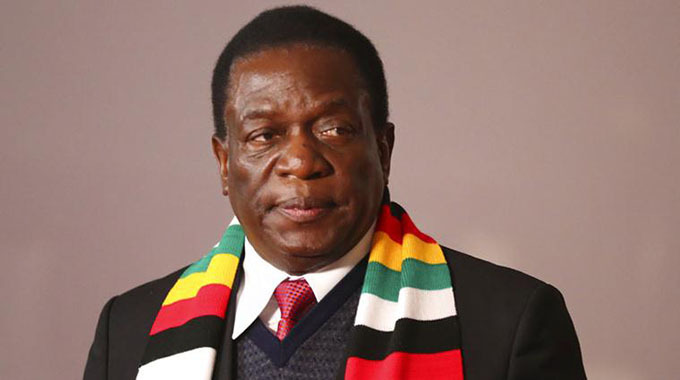 PRESIDENT Emmerson Mnangagwa has implored Zimbabweans to remain united, cherish peace and defend the country’s sovereignty and independence, saying these cardinal principles should not be sacrificed. The President also emphasised the need for citizens and political parties to embrace the spirit of dialogue, inclusivity and tolerance to foster nation-building and spur economic development. President Mnangagwa also rallied Zimbabweans to put aside political differences and unite in celebrating this year’s Independence Day, saying all opposition political leaders must be free and proud to partake in the Uhuru celebrations. In an exclusive interview with our Harare Bureau at State House yesterday, President Mnangagwa said the Independence Day celebrations were exclusively for Zimbabweans to reflect on moving the country forward. Asked if Government had invited members of the opposition, the President said all parties would be treated with “dignity and the respect they deserve” during Independence commemorations. In a separate embargoed interview with the Zimbabwe Broadcasting Corporation (ZBC) ahead of independence commemorations on Thursday, President Mnangagwa said this year’s Independence theme “Zimbabwe @39: Embracing Devolution for Vision 2030”, embodies Government’s commitment to vigorously implement decentralisation of power to local communities. He said Zimbabwe was a constitutional democracy that respects the provisions on devolution. “We have put some money, which is around RTGS$310 million, which translate to a huge sum that is given to each province to deal with priority areas which they themselves as a province, as a locality, as local communities, think are priority in their area; hence, the Government thinks globally over the entire country and says we think this is a priority in Manicaland, this is priority in Mashonaland East, this is a priority in Mat North, but the people in Mat North themselves if given a budget, they have priorities different from those structured or crafted by central Government,” said President Mnangagwa. He called on Zimbabweans to remain united, cherish peace and defend the country’s sovereignty and independence. “Our people, our citizens and proud Zimbabweans of this country: One, let us remain united. Two, let us cherish our peace. Three, let us defend wherever we are, night and day, our sovereignty and our independence – it cannot be sacrificed or sold. “This came to us through sacrifice. Many of our brothers and sisters gave a supreme sacrifice of their lives for us to enjoy this independence and sovereignty we enjoy today. So collectively and individually, let us protect our peace; let us protect our unity; let us protect our country; let us protect our resources (and) let us love each other,” he said. On the issue of the Midlands and Matabeleland disturbances of early independence referred to as Gukurahundi, the President said his recent dialogue with a group calling itself Matabeleland Collective was very useful. He said it was during the conversation with the group that authorities discovered that they were not against the Government of the day but wanted certain concerns addressed. “These are citizens of the country. I discovered that actually, it was unfortunate that in the past we did not entertain such dialogue. It’s very useful. We learnt a lot from that dialogue and in fact the differences are not critical. There are issues that are discussed and together craft a way of moving forward. We discovered that in fact they are not saying they don’t want the Government of the day. They are saying the Government of the day is failing us in this area and that area. And this is a platform where Government can explain itself and be able to appreciate the needs and priorities of the areas. Turning to the issue of sanctions, President Mnangagwa said the sanctions were rejected by the United Nations Security Council for being outside the framework of the United Nations Charter. More than 400 companies, he said, had closed because of sanctions. He, however, noted that his current efforts to attract investment to Zimbabwe will help create jobs. Government, he added, had created the One-Stop Investment Service Centre, which to be launched soon. Already, he said at least 59 projects have been approved. President Mnangagwa also emphasised the need for Zimbabweans to remain united. The Independence Day main celebrations will held at the National Sports Stadium. Prepations are underway across the country at provincial and district level.